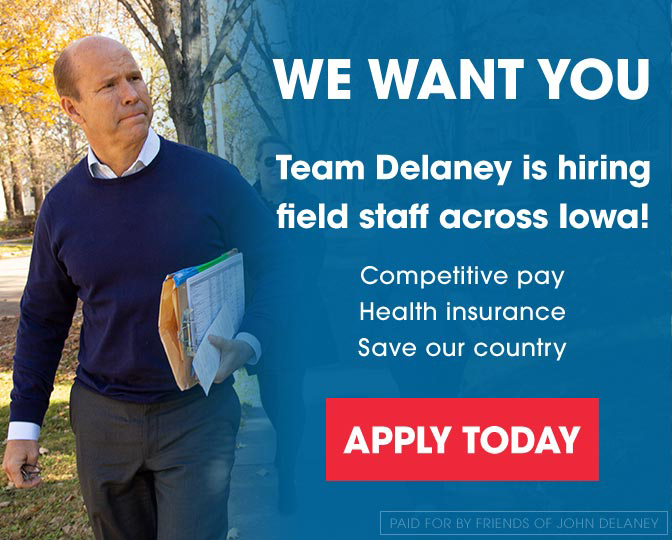 see also: https://www.johnkdelaney.com | FEC. (announced as senior advisor on Sept. 20, 2017) Founding partner of the Des Moines based bipartisan polling firm Red America Blue America (RABA) Research. Des Moines office of New Partners. Chief of staff to U.S. Rep. Bruce Braley (IA), 2009-14. Deputy chief of staff to U.S. Sen. Amy Klobuchar. Traveling chief of staff on John Edwards for President campaign in 2007. Campaign manager on U.S. Rep. Leonard Boswell (IA)'s 2004 re-election. Iowa native. Also served as U.S. Rep. Louise Slaughter (NY)’s chief of staff, and as a committee staffer to U.S. Sen. Maria Cantwell (WA). (Jan. 2019) Most recently associate general counsel at Verizon; worked there for 17 years. Associate at Williams & Connolly LLP, 1996-2001. Law clerk for Hon. Robert R. Beezer, Ninth Circuit Court of Appeals, 1995-96. J.D. from University of Virginia School of Law, 1995; B.A. in English and religious studies from University of Virginia, 1992. A senior legislative assistant in Delaney's congressional office. Office opening events: Des Moines (Jan. 12), Cedar Rapids (Jan. 12), Council Bluffs (Jan. 30), Sioux City (Jan. 30), Waterloo (Feb. 18), Fort Dodge (Mar. 16), Dubuque (Mar. 31), Davenport (Mar. 31). Total Iowa Staff of 25 as of Feb. 28, 2019. Connie Klug - (announced Jan. 7, 2019) From Adel, currently works as a business development manager for AT&T Sports and Entertainment. Served for nine years on the Des Moines General Board of Trustees. Paula Meyer - (announced Jan. 7, 2019) From St. Ansgar. Founded Friends of Ngong Road after a business career. M.B.A. from the University of Pennsylvania, Wharton School of Business; B.A. from Luther College. (Dec. 2018, announced Jan. 7, 2019) Campaign manager on Jackie Smith for Iowa State Senate in 2018. Worked on Pete D'Alessandro's 2018 primary campaign for Congress in IA-3. Sioux City regional field director and regional field director in Chicago on Bernie 2016. Worked on Chuy Garcia’s 2015 bid for mayor of Chicago. Worked on Gov. Pat Quinn’s re-election campaign in 2014. Has also organized in Washington State and New Jersey. Studied History, English Literature at Loyola University Chicago. From Chicago. (announced Jan. 7, 2019) Managing director at North Shore LLC in Cedar Rapids from April 2016. Business partner at Political Brinq, April 2013-April 2016. Studied occupational therapy at College of St. Catherine in the 1970s. (Jan. 2019) Senior, working toward bachelor's degree in communication, journalism and related programs from Iowa State University. Brand ambassador for Portobello Road Ames from Aug. 2018. Owner of RMC Studios in Ames from June 2018. (Nov. 2018) Canvass supervisor for the Iowa Democratic Party, July-Nov. 2012. Organizer with Working Families Win, Oct.-Nov. 2011. Assistant canvass manager for Iowa Green Home, May-Aug. 2011. Field organizer on Leonard Boswell for Congress, Aug.-Nov. 2010; canvasser for the Iowa Democratic Party, June-Aug. 2010; volunteer coordinator on Roxanne Conlin for Senate, April-June 2010. B.A. in political science from University of Northern Iowa, 2011. > On Jan. 7, 2018 the campaign announced it has 24 staff in Iowa. National Digital Director Makaiah Mohler ...to Feb. 2018, left to serve as deputy campaign manager on Jessica Morse for Congress (CA). Started with Friends of John Delaney in Feb. 2017. Field organizer on the Colorado Coordinated Campaign, June-Nov. 2016. Press assistant on Hillary for America in SF, May-June 2016. Bachelor's degree in government and women's and gender studies from Georgetown University, 2016.